OK, so a mom from Kissam Elementary is being told that passing STAAR is required to go to 6th grade. Let’s examine how we know this is not true. We see that rather than a 23% retention rate, the actual rate was 0%. 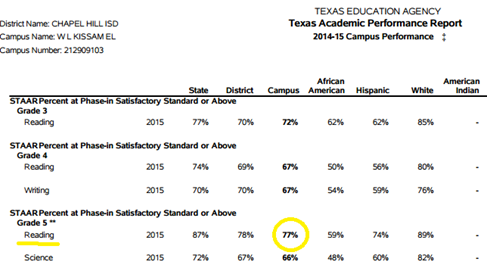 (For full disclosure, 15% of special ed kids were retained, but that number gives total retention of about 1.3%, nowhere near the 23% that would be required is STAAR passage was necessary for promotion. As you can see, every kid who appealed their retention to the GPC was promoted. This is one example of many. 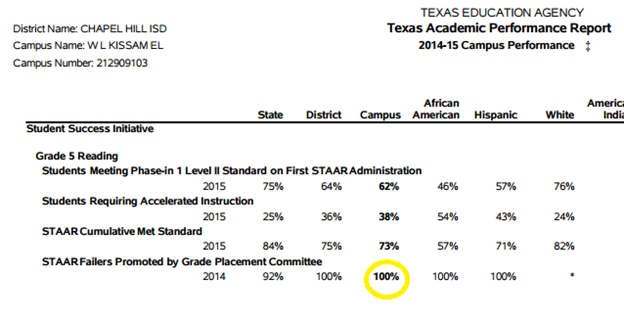 The idea that passing STAAR is required for promotion is utter nonsense. Know the facts and arm yourself! awesome dose of reality! Thank you! can they keep high school kids from graduating if we opt out and they pass their classes? My grandson attends a school as a transfer student. He’s an a/b student My daughter opted him out of testing and now she’s been told that the boys cannot return to school there next year. Is there anything that can be done. Transfer students can be subject to all kinds of conditions of attendance. Other than asking them to reconsider, nobody has a legal right to a transfer (except in very limited circumstances). Well, it’s not the law. Sorry your school treated you badly. File a grievance. Call the superintendent. Let them know you won’t be a pushover anymore! I looked up my schools record and it shows that 100% of the students took the STAAR test last year which is soo not true. My daughter did not take it and yet it says that she did. I wonder if i can get them for lying. I just got my 5th graders letter in the mail stating that she did not make the passing requirements for the staar tests for 2016, behind it was the Actual staar results paper from pearson which stats she was absent during both test.Wonder why the school is lying about her taking it. So did you just not send her to school on the test days or did you notify the school as well? And them at the end of the year, after you opted out, how did it affect things for her? Did they just go ahead and promote her of did you have to have a meeting? Sorry, we are military and from Ohio so this is all very foreign to us! Thanks for any information you can offer. Ware can I find this academic performance report for my school district?